With 48.8 million “employees”，Qutoutiao Inc. (means “fun headlines”), a two-year old mobile-news company becomes one of the biggest news and video aggregator in China. Being available at application stores since Jun. 2016, the number of Qutoutiao’s users has witnessed a rapid increase to 17.1 million for daily active and 48.8 million monthly active in September 2018 (Bloomberg 2018). Their main strategy to keep users is rewarding them with Qutoutiao’s coins every time they read or introduce to a new friend, which can be transferred into Alipay and WeChat wallet at certain exchange rate. Reading, sharing, in inviting new users in Qutoutiao can be understood as unrecognised labour that turned into economic value (Trebor Scholz and Laura Y. Liu, 2016). It is the enormous group of digital labours who are eager to make some pocket money regardless how much time they would work for this news app who offered their data and helped Qutoutiao’s 718 million ads revenue in the first half of 2018 (Shijie 2018). However, as the Chief Strategy Officer Oliver Chen described, giving money to their users is just followed their dream to cultivate user’s reading habit. Their success should attribute to their first focus on people in “lower-tier” market, and the special algorithm to offer tailored content that their target group need but could not be fed by the “elite” application. 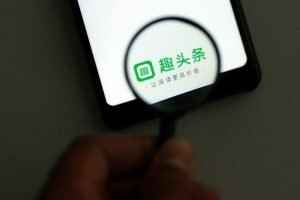 Qutoutiao’s case will show a clear example that how these “lower-tier city” residences are involved in digital capital system as labours while are redefined themselves through their labour. As Qutoutiao’s prospectus shows, its users averagely spend about 55.4 minutes on the app a day, with a sophisticated rewarding system instantly encourage people being addicted to it (Shijie 2018). Besides reading, there are also tasks like log-in, commenting, collecting possible coins at home page every 30 minutes, and etc., keeping users open the application all day long. Being addicted to certain digital product, as Jack Linchuan Qiu points out, is one of the most import part of digital capitalism (2014). Only when users are addicted to certain digital products—like people are addicted to sugar at early capital age, can users, named iSlave in his words, be willing and naturally desire to provide more data to certain digital platform like their preference, on-line time, places, and etc. Among all these tasks, rewarded reading is the most famous one, as the Qutoutiao Inc. describes it as a way to cultivate people’s reading habit. When a user opens up an article and rolls down the screen, a clock will appear on the right corner counting for one minute. After then, the user will obtain 20 coins as a reward. The clock is not only a time machine but also a capital-counting machine: counting for how many on-line time users have created for it. When reading 80 minutes, users could earn 1 CNY. Meanwhile, through deeply-embedded in its users’ social network, through coin-winning tasks like “awake”, “share” and etc., Qutoutiao enables to keep users active and efficiently enlarge its group of users. The tasks to “awake” theirs worth 1000 coins, put users into each other’s surveillance: once a labour refuses to work, there will be their parents, children, close friends or other people in their social network, trying to “save” him/her back to the app. On the other hand, inviting new users earns most among all these tasks, worth directly 8 CNY per person, making developing new users a centred way to make some money by using the app. In a competition of inviting new users this summer, user Mr. White won the 36,000 CNY prize for inviting total 2578 new users after two-month and 14-18 per day’s searching work. Traditionally, newspaper required users to pay or read before or after work, but users in Qutoutiao are paid while reading news, any time of a day. It can be seen clearly than any other case—although users are cultivated to be desired to offer their data at their own wills, the essence of their data-sharing practices is digital labour, in a way of blurring of leisure and labour time (Fuchs 2014). According to Qutoutiao’s official website, it is the first mobile news application that targets “lower-tier cities”, which refers to a wide region except the capital city of every province. As it is reported by Analysys Ltd., at the end of 2017, the population in “lower-tier cities” is 1.027 billion half of whom are just starting to have mobile devices, remarked as a brand new market (Qutoutiao Offical Website, 2018). The question is, through every rewarded reading, sharing, and commenting whether the users make their own choose to their preference? Qutoutiao’s recommendation system is based on algorithm to track users’ view history and personal profile then to match “valuable” news for certain users. It requires a large database. According to its prospectus, in 2018, Qutoutiao only spent 5.7281 million on buying content, 8% of the whole expense. Low content expense means the company would not be able to cooperate with serious new agency; instead, it invited individual media posters (self-media owners) to post entertainment articles in its platform. Just as Gitelman points raw data is cooked (Gitelman 2013), Qutoutiao’s database is partial due to limiting expense. Although the users can choose which to read, share, and comment, they have already been shut out of the serious news world. Qiu, Linchuan. “Goodbye to iSlave: ICT, Digital Capitalism, Net Labour Resistance (In Chinese)”. Society (Chinese), Vol. 34(4) 119-137, 2014. Share Lab. “Immaterial Labour and Data Harvesting”. 21 August 2016. Shijie Newsseeker. 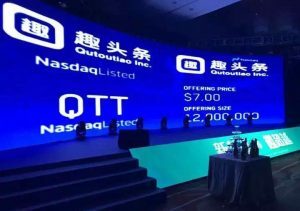 “Qutoutiao Shijie 2018 Listed in IPO With Blood (In Chinese)”. Shijie, 14 September 2018. Is HTML the solution for digital reading?